Want to help me identify some of these? Okay, the top two are easy. Crochet hooks. The next one could be a ‘needle’ – it’s flat, but could be used to thread elastic through a casing, or something of that sort. The turned pointy one below that… hmmm… could be used to make holes, like the one second from the bottom, but it’s a little blunt. I assume the hole in the end is to attach a ribbon or cord, rather than an eye for threading. The bottom one is obviously an awl. But the big question is, what the heck is that spoon-ish tool?? I don’t think these are a set, but just similar items that were put together to sell more easily. (And of course they did – to me, for $2.00.) So some of them may not be textile tools at all. I’d appreciate any ideas or information! Now that I’ve finished the first round of Christmas stockings, I can get back to my works-in-progress, right? Wrong. Well, I have been working some on the Celtic Braid Socks, but repeatedly losing the cable needle doesn’t help. Nor does repeatedly dropping stitches in poor lighting so I end up having to rip back hours worth of work. I love these socks and this yarn, but I’m having trouble demonstrating that affection. So, on the little browse around town with the hubby on New Year’s Eve, besides my above purchase, we dropped in my newish local yarn shop, Sugar Bunny Boulevard. This was his first visit, and it was rather amusing, in a sad sort of way, to see the reaction of the proprietor’s young daughter when a MAN strolled in a couple of minutes behind me. Her world apparently righted itself when we told her he was with me. Sigh. Maybe one of these days she’ll stop thinking male shoppers were misdirected. He found a lovely wool marl yarn for a scarf. I mostly loathe knitting scarves, but will happily make one for him! What I found was Debbie Bliss Baby Cashmerino. Although the two yarns seem at first glance to be about the same thickness, the difference in yarn construction is a consideration. The Mini Mochi is a softly spun single ply, and the Cashmerino is a bouncy, plied yarn, which means they behave differently on the needles. To compensate, I adjusted the herringbone stitch pattern a bit to make the colorful zigzags two stitches high, and the beige ones only one stitch. That balances them out well enough to suit me! 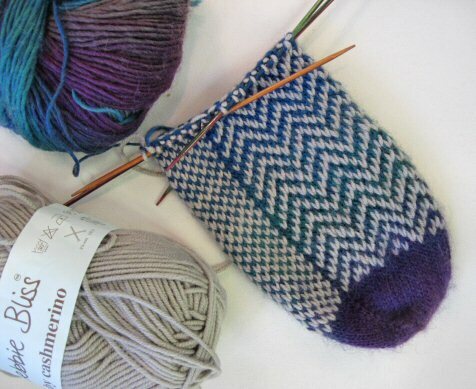 The sole is in alternating colored stitches, and the top of the foot in the herringbone pattern. These socks are really going fast, because they’re fun to knit! Have I mentioned that I’m easily amused? I can’t wait to see how the color will gradually change into the next one, and have to resist pulling way too much yarn out of the ball just to see what’s next. I wonder what color the heel will be?? Very cool find! The weird curvy one looks a bit like a tool I used once in a wheelthrowing class. There were all sorts of silly-looking tools for creating textures/stripes/whatever on clay . . .
Say, it does rather look like a clay tool, doesn’t it? (I’ve done a bit of wheel thrown pottery in my time, too, and used a wide variety of odd tools.) But I don’t think it was intended for that use. It seems a little too… hmm… genteel. Still, that’s one more idea than I came up with! My friend spotted the third one down & we’re thinking nalbinding tool that looks like this one — dang it own’t paste the pic. Try to google that word & you will see pics, one with pink yarn & one with green — when you enlarge, there is a very similar tool. Hmm… I didn’t get the same results you did on the search. If you still have the link, feel free to email it to me! I’m thinking first two knitting, second three tapestry, third two felting but some of those bottom ones might be mixed up? I hope this helped. 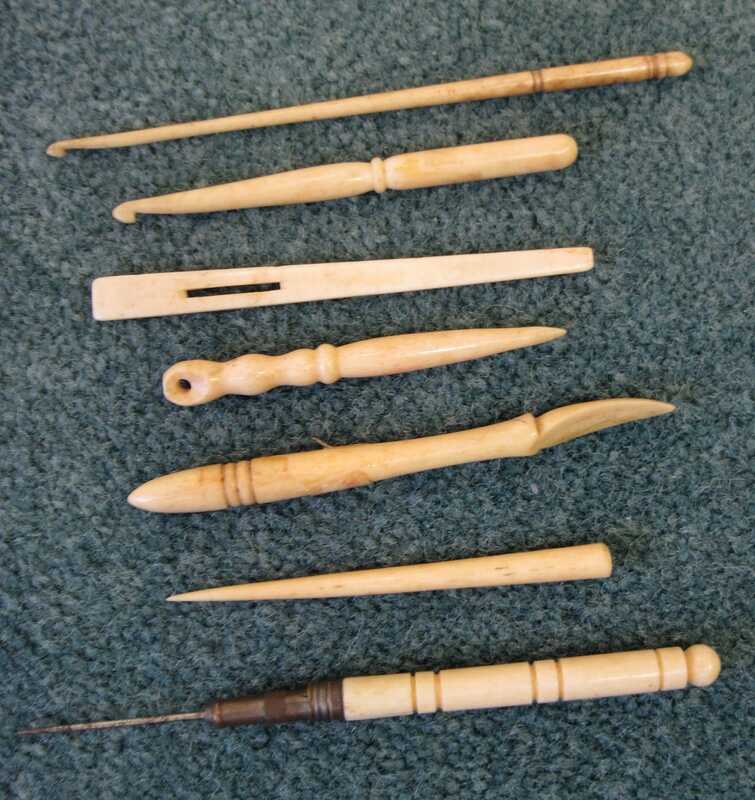 From top to bottom: crochet hook, crochet hook, nalbinding needle, bobbin for bobbin lace making, laying tool, laying tool, and an awl.